It may only be a small patch of grass, but it's one of the most iconic locations in Colombo. 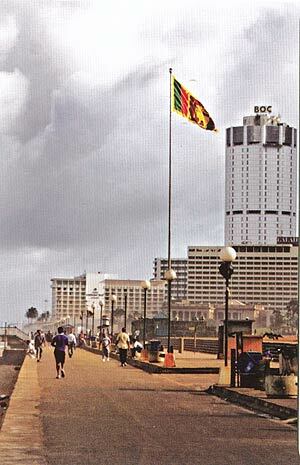 Galle Face Green, a rectangular stretch of grass along the Galle Road in Colombo's Fort area, is the city's most popular recreational space. 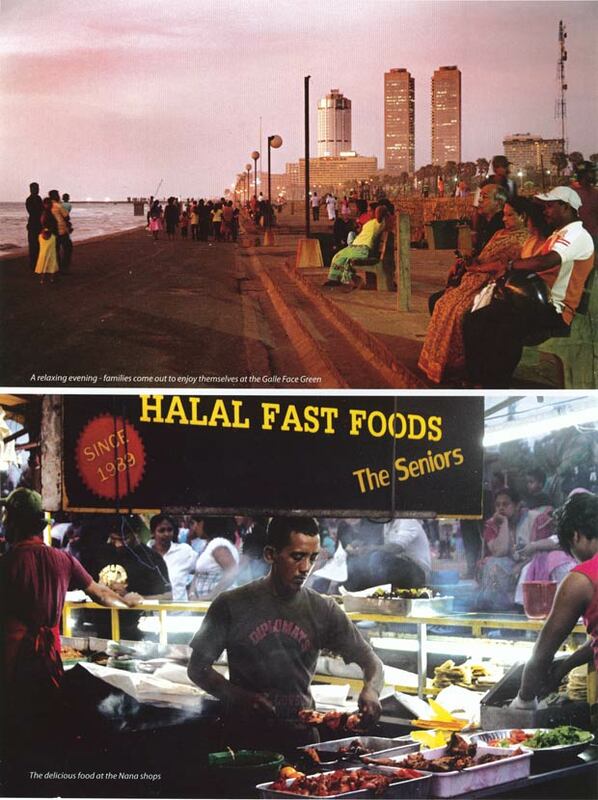 While its origins are traced back to the 19th Century, the Galle Face Green — like the city it is part of — has gone through many phases in its life. But it has never lost its magnetism or its vibrant soul. The Galle Face Green is a happy place. Ask any Colombo dweller what you should do when visiting Colombo, and a walk along the Galle Face Green will certainly be in the 'Top Five Must-Do' list. It's one of the most egalitarian places in the city, where all ethnicities, backgrounds and social circles mix in a spirit of fun and enjoyment. There's no entrance fee and it never closes. Although originally a much larger space, the Green now officially spans a five hectare strip, bordered on one side by the Indian Ocean and by the bustling Galle Road on the other. It's boxed in on the left by Galle Face Hotel and on the right the Green fades off into a stretch of concrete, where the grand old canons left behind by the British Artillery remain, resolutely facing the Indian ocean. There is a newly built pier which is a favourite fishing spot as well as a lovely strolling area at dusk. There's always something happening at 'Galle Face', as the locals call it. 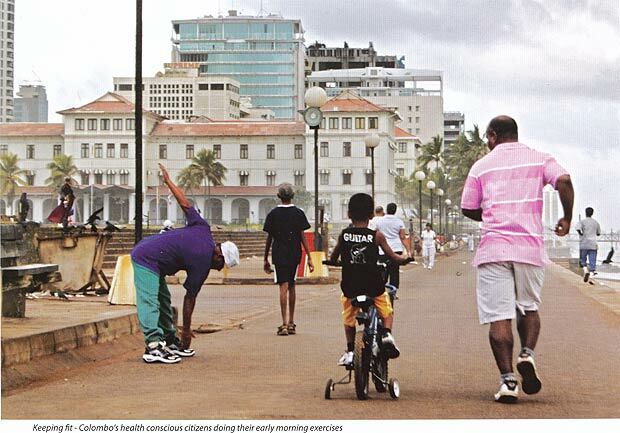 Visit early morning and you will find Colombo's health conscious citizens walking and jogging along the seaside stretch, enjoying the cool morning breeze. Young soldiers from the nearby Army camp carry out their morning exercise drills at the Green and their enthusiastic jumps and stretches add vigour to the lazy feeling that covers the Green at that time of the morning. It was in 1859 that Governor Henry Ward set aside a wide stretch of land for recreational use. It was originally used for horse races and also as a golf course and called the Colpetty Racecourse. The Promenade was the place to be on weekend evenings, and society ladies would turn out in their latest outfits to be shown off as they strolled along the Green. 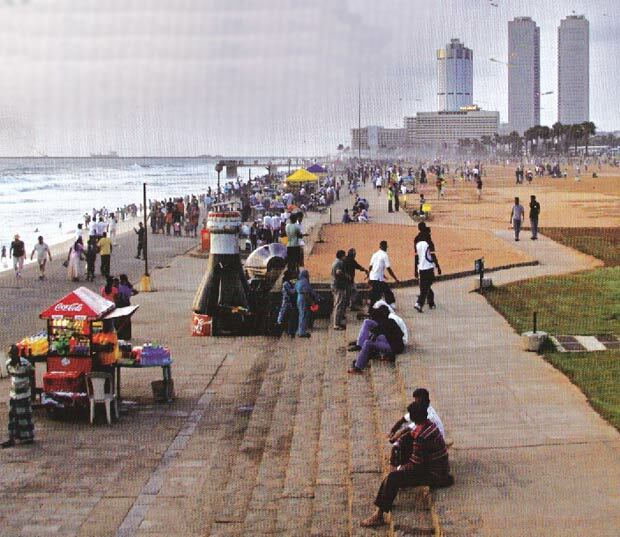 In addition to the personal recreation opportunities offered by this green space, Galle Face is also a popular spot for open air musical shows, religious functions and other public events. State functions and celebrations are also held at the Green. 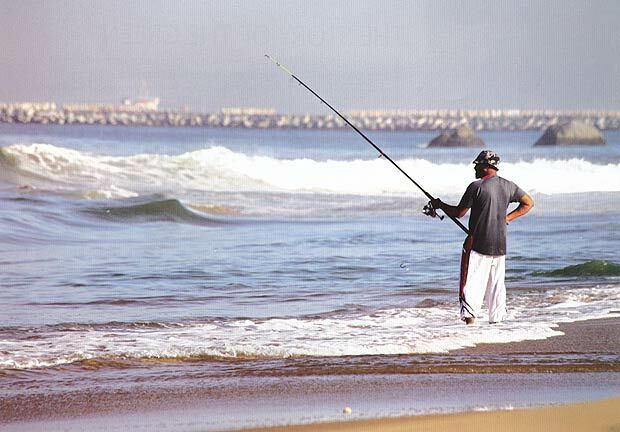 Fishing is a popular sport and the new pier provides a convenient spot for fishing. While some prefer to fish early in the morning, a few feel thebest time is the morning after a rain shower, as it brings the fish closer to the shore to feed. Others perform this activity on a daily routine, as it is their livelihood. You will see even the amateur fishermen coming along throughout the day and also as dusk falls, rods in hand and hope in mind. Since there is little shade, the Green is best avoided during midday. Only young lovers brave the Green at this time, knowing that the scorching sun will keep out prying eyes. Courting couples seated under umbrellas on Galle Face are such a common sight that it has now become the norm. But as the sun begins to set, the Green comes alive! This is my favourite time to visit Galle Face, as the food vendors start setting up their stalls, the kite sellers arrange their wares on the ground and families with children start pouring in to play cricket and other games — all bathed in the glow of a blazing orange, setting sun. There is something for everyone. For 'foodies' like me there is the allure of the numerous food stalls. Set up along the stretch facing the ocean, you can take a walk and simply enjoy the smells emerging from each stall, to get your gastric juices flowing. The 'Isso vadai', lentil cakes topped with a few prawns fried in hot oil, is a famous snack found here. Achcharu, pickled fruit in a range of fruits and flavours, and kadala, boiled chick peas served up with some grated fresh coconut and fried red chillies are the other popular snacks along the Green. If you want more substantial fare, check out the "Nana" shops(pronounced na-na, the term used for older brother in the muslim community) that sell porata (flaky rotis) and kottu rotti with any combination of meat or vegetable of your preference, they also have biryani, string hopper biryani and a variety of vadais. If you're thirsty, the Nana shops have 'sherbert' drinks, or the Saruwath sellers with their multi-coloured drinks await you. While there are many sherbert flavours around the world, Sri Lanka seems to have chosen the 'rose essence' flavour as our own and all the sherberts come with rose essence flavoured water in a range of colours and topped up with crushed ice, soaked basil seeds (called kasa kosa) and — if you're lucky — pieces of jelly or thin strips of gelatine. Saruwath is a similar refreshing drink, madeup of the water used to soak the basil seeds and served with food colouring and some of the basil seeds. And to top off the meal, there's always dessert! The dessert of choice on Galle Face Green is ice cream in a cone, and there are dozens of ice cream trucks which have a brisk business every day. The local candy floss or bombai motai sellers offer a more stickier, but equally delicious, alternative to ice cream. Before you think that Galle Face is all about eating, let me move on to the many other things that add to the dynamism of this space. The clear green lawn calls out to play, and while light lasts you will find young boys and men playing cricket and other children playing with toys that are sold on the Green. 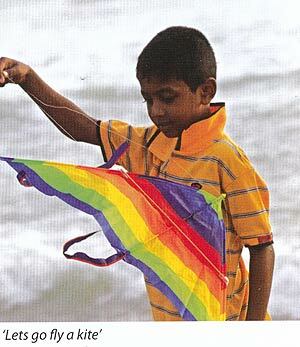 Kite flying is something that is popular at Galle Face because of the stretch of open skies, and many vendors now sell a variety of creative kite designs. If you want to try your hand at kite flying, get there while there is still some light. A few energetic young people now rollerblade on the new stretch of concrete, while a few skateboards can also sometimes be seen. But most people enjoy Galle Face at a slower pace — walking along the promenade, witnessing a breathtaking sunset, sitting on the grass under a starlit sky or simply enjoying a relaxing time in the open air and surrounded by a fresh sea breeze. Whatever you choose to do when you visit Galle Face, you'll be assured of good times and good memories.